A group of young Afghan women carrying wicker baskets and picking Saffron in Heart outskirts last week was a nice photograph. Saffron has actually added spice to Afghanistan’s drug war as the war-torn country continues to be world’s top opium exporter. Equally impressive was a group of five Saffron experts from SKUAST flying to Kabul for the fifth Saffron Conference. Led by Nazeer Ahmed, the SKUAST VC, these ‘experts’ are key to Kabul’s spice dreams. I had the rare privilege of interacting with the first group of Afghan farmers who were flown to pick up the best practices of the spice cultivation in CITH’s vast farms deep inside Damodar Karewa, many years back. Nazeer then led the CITH and his presence at Kabul is acknowledgement to his efforts in training these farmers whose basic knowledge had come during their stay in Iran as refugees. Still being grown on slightly less than 2000 hectares of land, Afghan saffron is creating waves. It was adjudged first in a series of global competitions, for the last three years, uninterrupted. Irrigation and Livestock minister Nasir Durrani told the conference that they have improved by exports by one-third. “Farmers earned $12 million income from saffron production this year against last year’s $9 million,” he said. This year exports could touch five tons. Kashmir deserves part of the credit for Kabul’s spice story. But what about Pampore, the spot made famous by the spice, for centuries now. It is expected to lose two-third of saffron it reaped last year. 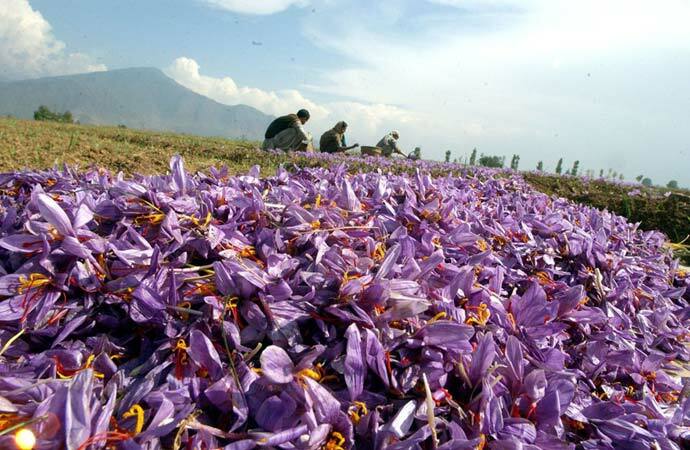 Kashmir produced 16 tons of saffron last year which was a bumper crop. This year, there are quite a few flowers around. Entire saffron fields look like ploughed fields ready for some kind of plantation. But the fact is that these fields are victims of the dry spell. Harvested during October and November, nature has historically remained kind in offering the right precipitation that lead to adequate showers that moist the soil bed. Flowers sprout out when the beds have adequate moisture. This year rain gods played devious. Peasantry in Pampore outskirts is shocked over the turn of events. They have already invested a fortune in pre-harvest activities. The crop failure will reinforce the thought process that saffron fields are a liability. Saffron land is already under pressure. Till 1997, saffron was being grown on 5707 hectares across Kashmir and in 2015, it measured only 3785 hectares. The per-hectare yield has also nose-dived. This had paved way for part of the land getting arbitrarily used for housing, garrisons and for earth-filling as the owners would get more money by selling the soil. Even apple orchards are coming up. But this is a crisis that we can not blame Delhi for, as has been the tradition and routine. 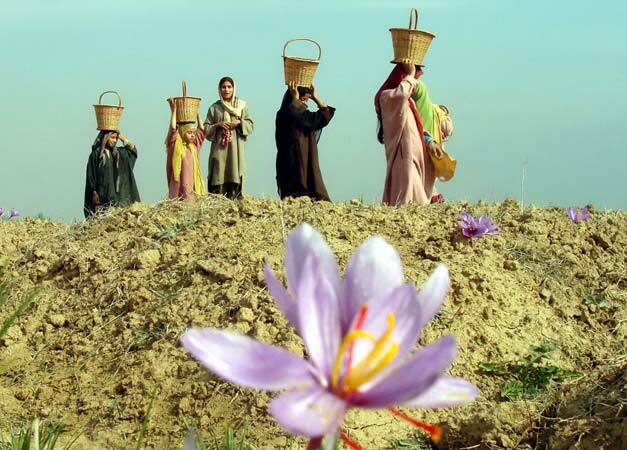 The blow to saffron farming is a local manufacture, purely indigenous. It was Congress government, way back, in 2010 approved a Rs 376 crore (later some cost escalations were added pushing it to more than Rs 400 crore) Saffron Mission envisaging changing the bulb and intervening in managing the drip irrigation part. The Mission was to be completed within four years envisages establishing 128 tube wells and distribution of 3715 sprinkle sets among growers. It excluded setting up of Rs 16 crore Spice Park. J&K government did a Jaspal Bhatti to the Mission. It is 2017, and it is incomplete. It is the key factor that led to the failure of the crop this autumn. Ideally, the government should have created an SPV sort of a structure to implement it as quickly as possible. But it created work jobs in the scheme and gave it a typical Kashmir style disbursal. Normally, the focus should have been on irrigation part first because it was mechanical and required having bore wells and laying lot of piped structures. While the farmers were given cash to purchase the new bulbs, a good start, the mechanical part was delayed. Right now almost everything is ready in the main saffron land karewas but the only exception is water. This is despite that 101 bore-wells are dug but water is not any where. Only four are fully functional. Of 128, only eight sprinkler systems stand installed. What a bad implementation of a nice initiative! Government knew it failed. The only patch that is working is in the immediate surrounding of the junior agriculture minister Zahoor Ahmad Mir. People have started asking questions that if the systems can function in the minister’s area, why it cannot work in main Pampore. Is it punishment or discrimination? Weatherman had forecast the weather situation and the authorities at all levels knew it. The government slept an exit it has standardized in last three years. As the crisis started revealing itself, I am told, there were suggestions to the agriculture ministry that the state should hire a couple of helicopters to manage aerial sprinkling, a system used across all the saffron growing places in the world. It was not agreed at all even tough it would have cost not more than Rs 20 crore. Had the government spent this petty sum, Pampore would not have been cracking jokes that Kabul should swipe its agriculture practice with Pampore. Kashmir sent saffron to Heart and in reverse poppy can come to Pampore, now! !